DUG Insight User ManualFrequently Asked QuestionsFrequently Asked Questions Sessions and ProjectsWhat is the best way to copy and send DUG my project database? Depending on the situation, Insight support may request your project database for analysis in-house. This is a quick guide on how to copy and send your project database files to us. The safest way to copy a project database is to use the Backup feature in Insight's Data Manager tool (see Backup a Project Database). From the DUG Insight Launcher, select the project that you want to copy and the Data Manager application, and click Launch. The Data Manager window will be displayed. In the Data Manager window, select Backup. Choose a Backup Parent Directory where you want to keep a copy of the project, or create a new parent directory. Deselect Copy dugio volumes, Copy horizons and Copy images. We are only interested in the project database (.dugprj) file. Click Create Backup to copy your project. A notice will appear to confirm that the copy has been created at the path you specified. Right click on the backup project directory, select Send to and create a compressed (zipped) folder. Send this zipped copy to support@dugeo.com or upload it to our FTP site (see How to upload to our FTP server? for instructions). Alternatively, if you do not have access to the Data Manager tool, you can directly copy the database file from the project directory. Navigate to the project directory of the database. 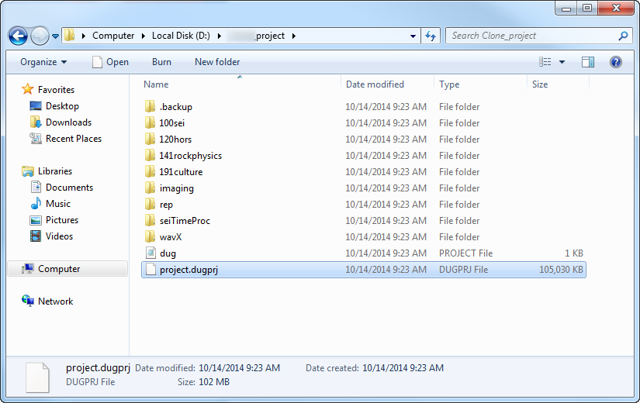 Right click on the project.dugprj file, select Send to and create a Compressed (zipped) folder. Prev: Why doesn't my floating licence work, even after a successful activation? Next: How do I load sample data?